It’s impossible not to enter into the festive spirit when the city is adorned with Christmas lights. This year, different corners of the city centre are coming alive with street entertainment for the Big Christmas Lights Switch-On. The Peace Gardens will host the main stage, right by the huge Christmas tree and strings of lights ready to be illuminated. Heart FM breakfast presenters, Dixie and Emma, will be introducing acts, including the cast of this year’s Mother Goose pantomime at the Lyceum, actor Jake Canuso and panto legend Damien Williams. There will be performances from dance troops, choirs and some of the biggest talents to be discovered on TV talent shows, The X Factor and BGT, including Sheffield singing talent and Britain’s Got Talent finalist, Kyle Tomlinson. Leopold Square will become a winter wonderland with a snow machine, real life reindeer and a sleigh, and live music. Ryan Taylor, Leopold Square's resident DJ, will be entertaining the crowds with a variety of Christmas hits to help get visitors into the spirit of the festive season before attendees are invited to pop into one of the square’s many restaurants and bars to sample some of their festive menu delights. The Moor is pulling out all the stops with panto characters, carol singing, a mini ice rink, fairground rides, face painting, and more, with events starting from 12.30pm. A brass band will be performing and kids can enjoy rides, a carousel and skating on a mini ice rink. Santa and the reindeers will also be there and the Moor Tree switch on will take place at 4.30pm. The Winter Garden will be transformed into an enchanted winter wonderland, and will be home to a fairy grotto, craft activities and carols. 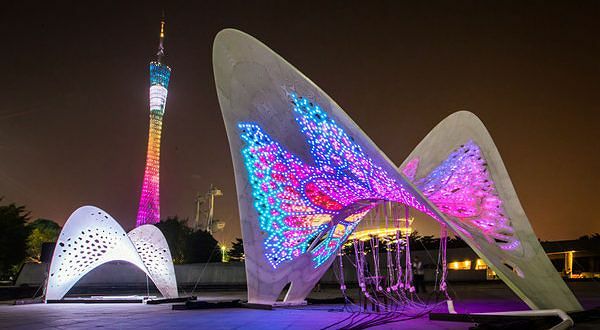 On Millennium Square, you will find 3D illuminated butterflies which feature over a 100 different lighting styles, the tallest of which is over six metres high. Make sure you’re gathered at the Peace Gardens for 5.30pm to join in the big countdown on the main stage. The Big Switch On will finish at 6:30pm, so why not hang about and enjoy a meal out and one of Sheffield’s fabulous food and drink spots, read Alive After 5’s guide to some of the best places to eat and drink in the city. Keep an eye out for This is Sheffield at Christmas, our free guide to all things festive in the city centre, out now and available to pick up from the Winter Garden.